Lagos in the red, Short documentary film (2013). Jelili Atiku, Lagos in Red. Still from the short documentary film (2013). Courtesy of the artist. Born 1968 in Ejigbo, Lagos, Nigeria; lives and works in Lagos. Nigerian multimedia artist, Jelili Atiku refers to himself as a human rights artist, advocating in his work social, economic, and political human rights and the establishment of an egalitarian society. Atiku has put his art at service of the prevailing concerns of our times; especially the issues that threaten our collective existence and the sustenance of our universe. His art is for Atiku a medium for protest, to raise awareness and to bring about change. Atiku always looks to connect with real people and shared experiences, such as the war and reign of the military government. Atiku is actively involved in numerous public service organizations and is the founder of Advocate for Human Rights Through Arts and AFiRIperFOMA Biennial. 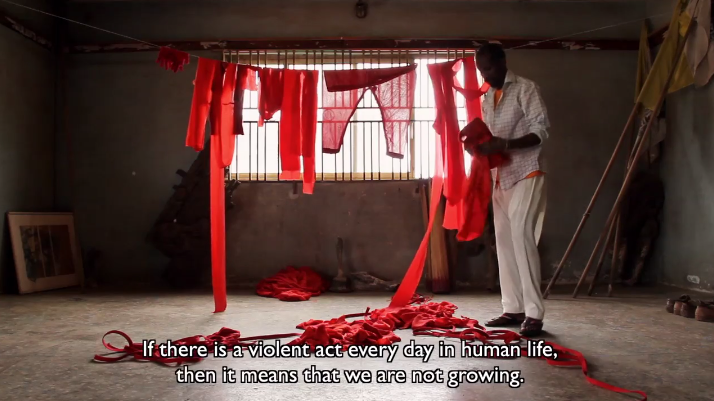 The VENICE INTERNATIONAL PERFORMANCE ART WEEK 2014 screens the short documentary film Lagos in the red (2013) by Danish filmmakers Lotte Løvholm, Nanna Nielsen and Karen Andersen produced with support from Danida 2013. It documents one of Atiku's performances in the Lagos neighbourhood of Ejigbo. Atiku brings to life a discussion of violence, crisis, national consciousness and humanity in the streets of Lagos.